At electronica, researchers from Fraunhofer IZM were showcasing a novel type of electro-optical circuit boards (EOCB), embedding optical connections and data paths within the bulk of a glass panel. Using a proprietary process involving metal patterning and various dips in salt melts, the researchers were able to diffuse silver ions into the glass and also extract sodium ions following precise patterns pattern so as to modify the refractive index of the glass and form well defined embedded waveguides. Using low-cost display glass plates about 300 to 500um thick (as large as 440x305mm), the researchers were able to bury various optical waveguides with a gradient refractive index profile for low dispersion and low loss, demonstrating under 0.1dB/cm of loss for wavelengths of 1310 and 1550nm both for single-mode and multi-mode waveguides. On the Fraunhofer IZM stand, a large EOCB was fitted with optical connectors plugged directly onto cut-out edges, aligning their optical fibre with waveguides embedded within the bulk of the glass substrate while copper traces at the surface could receive any pick-and-place components. 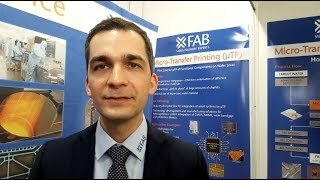 Research assistant Julian Schwietering who was demonstrating the EOCB emphasized that such solutions would be required in the future for high-speed board-to-board or even chip-to-chip optical interconnects. Next the researchers want to design micro gratings and mirrors in order to couple-in or out-couple light signals from electro-optical chips directly mounted at the surface.